Cut the chicken thighs into cubes. Prepare the marinade: peel the garlic cloves and crush them (or finely chop them). Peel the ginger and finely grate. Put both into a bowl and add the lime juice and soy sauce. Pour a quarter of the marinade into a smaller bowl and set aside. 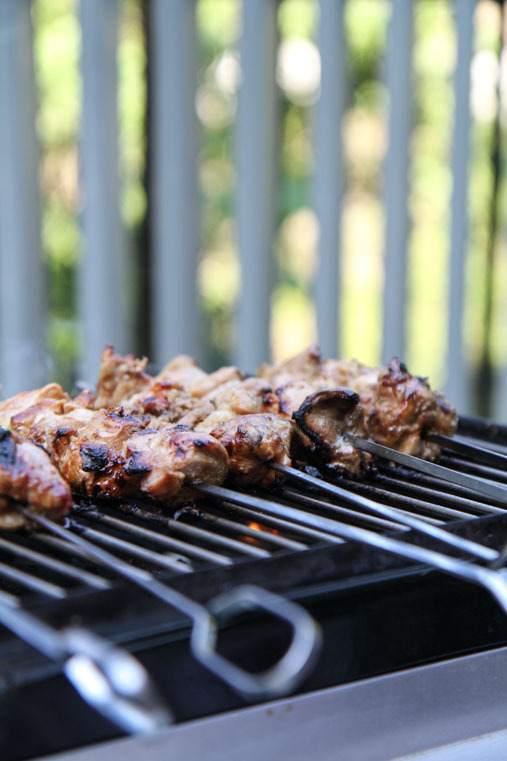 Use the remaining marinade and cover the chicken cubes with it. Cover and leave to marinade for at least 4 hours in the fridge (best is overnight). 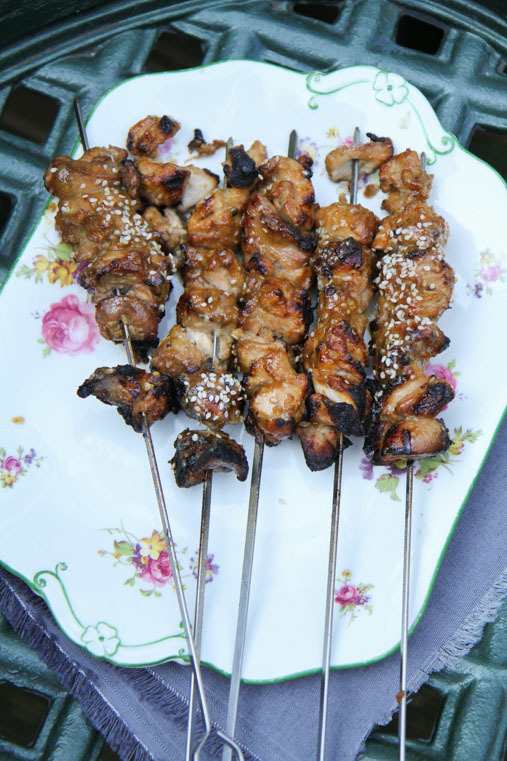 Once the chicken has marinated, stick the chicken cubes onto 4 chicken skewers and put on the hot barbecue. Grill for 10 minutes while regularly turning. 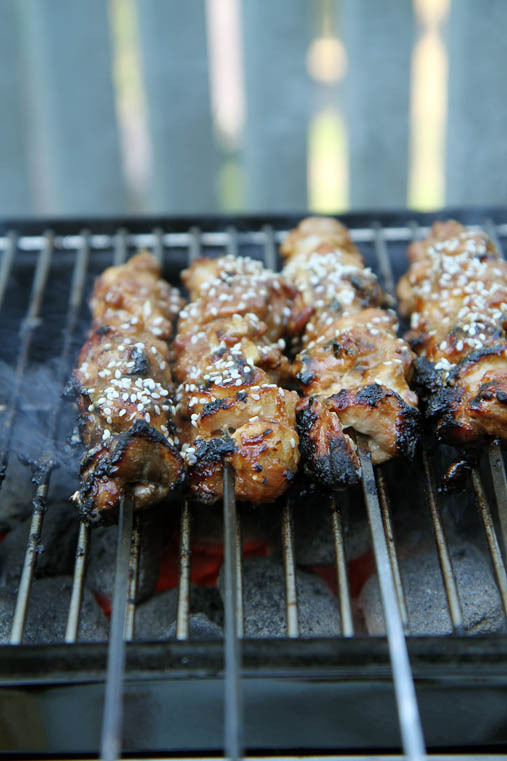 Meanwhile add the tahini and runny honey to the marinade you’ve set aside earlier. 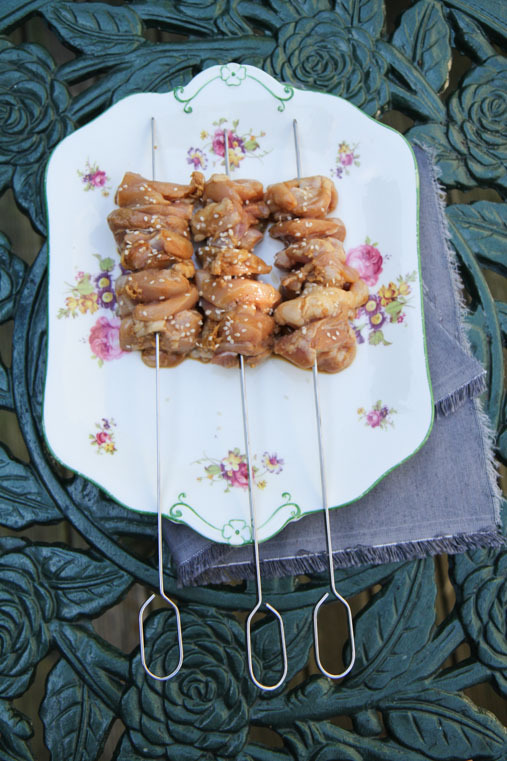 Once the chicken has cooked through, brush the chicken skewers with the tahini marinade, sprinkle some sesame seeds over them and keep grilling for a few more minutes while brushing more marinade onto them so that you get a sticky glaze. Enjoy. Aww, thank you Melissa. We need to organize that Tayyabs extravaganza soon, I’m craving paneer! Ha, danke Thea! War echt nicht so einfach den Grill anzuschmeißen, aber war schussendlich super lecker! You’re awesome Anne, hope to catch up with you soon! Kleine neue Kartoffeln kochen. Etwas auskühlen lassen und nicht ganz entzwei schneiden. Die Flächen salzen und mit einem Salbeiblatt belegen und zusammenklappen. Mit Speck umwickeln, mit Zahnstochern fixieren und auf dem Grill braten bis der Speck kross ist. Maya, das hört sich himmlisch an!!! Muß ich unbedingt probieren, au ja!